Bookbinding Etsy Street Team: Binding on a Budget- Scraps! 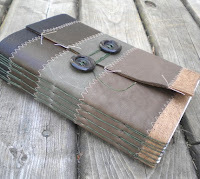 Rhonda of MyHandboundBooks stitches leather scraps together to make amazing covers for her Reduce, Reuse, and Recycle leather journals. A similar effect can be made with paper scraps; either stitch scraps together or glue them down into a pattern on a thin yet strong paper substrate (like mulberry tissue) to create a "quilted" paper ready for covering a cover board. Little books in the form of earrings, key chains and necklace charms are just a few of the cute little things you can make from small bits of paper, board and thread that would otherwise go to waste. 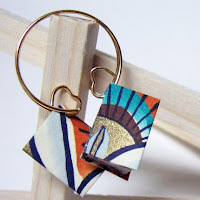 Kiley of KupoKiley makes beautiful and fully functional book earrings entirely from her scraps left from larger projects. For more inspiration be sure to search Etsy for "bookbindingteam" and "earring" or "necklace" there's a lot of lovely work being done out there! Buying handmade directly from the artist is a very personal thing, and very few things are more personal and special than a hand written thank you note. 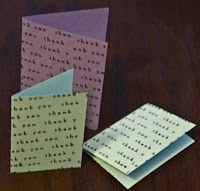 A simple "thank you" stamp can transform solid paper scraps to special notes of thanks for your customers. Pretty papers can also be glued to strips of scrap card stock to make special, bonus bookmark for your customers- another way to add that extra something and let your customers know you care! If you're short on time and don't think you'll ever get around to using all those scraps there's still a few homes better than the trash! Consider putting together a "de-stash" packet of paper goodies for sale on Etsy. Collage artists, origami enthusiasts, and many more would be delighted to get their hands on beautiful paper scraps we bookbinders generate. Also consider donation- check with your child's teacher, your church, or community center and see if they'd be interested in scraps for use in art projects. And be sure to check around your area for local organizations like ArtStart in St. Paul, MN who have programs already in place for taking scraps and using them for art education. And as always, share your tips in the comments below! I was actually just organizing my studio, still unable to part with my stack of lovely paper strips that I never actually find a use for. Thanks for the great ideas. In the bindery, I usually try to collect all the scraps to reuse them in many ways, or just because "it will be useful...somehow". When I risk to be sunken, I usually give all the pieces for the nursery school close to our atelier or to a friend that create items for the local Red Cross fundraising: in some way, they're never waisted! Lets all try to be a bit greener!